The jury that convicted Boston Marathon bomber Dzhokhar Tsarnaev has begun deliberating whether he should be sentenced to life in prison or execution by lethal injection. Jurors got the case late Wednesday afternoon after federal prosecutors made their final impassioned arguments that Tsarnaev should be put to death and his lawyers asked for mercy. "The importance of your deliberations should be obvious," Judge George O'Toole Jr. told the panel. "This has been a long case. You must each decide this case for yourself." 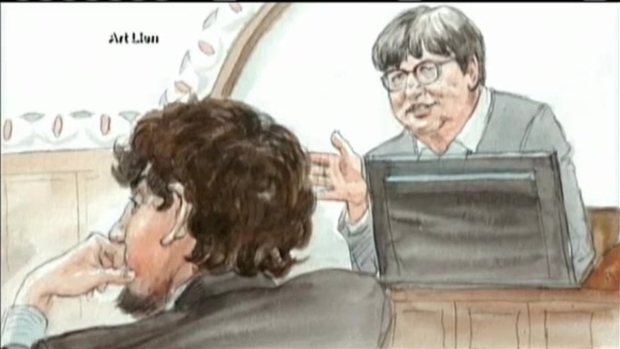 Prosecutor Steve Mellin said Tsarnaev's actions "have earned him a sentence of death." The defendant wanted to cause his victims as much physical pain as possible to make a political statement, he said. "The bombs burned their skin, shattered their bones and ripped their flesh," Mellin said. The bombing "disfigured their bodies, twisted their limbs and punched gaping holes into their legs and torsos." "Merely killing the person," he said, "isn't nearly as terrifying as shredding them apart." 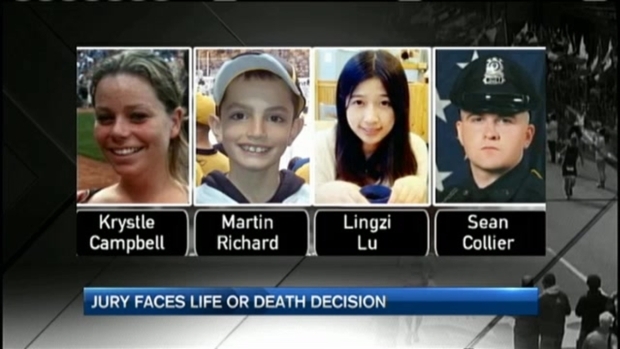 The prosecutor showed a large photograph of 8-year-old Martin Richard, who was killed in the attack, and other children standing on a metal barricade near where Tsarnaev placed his bomb. He showed another photo of bloodied victims on the sidewalk. "This is what terrorism looks like," he said. Mellin said Tsarnaev showed no regret after the bombings, nonchalantly going to buy a half gallon of milk 20 minutes later. "He acted like it was any other day. He was stress-free and remorse-free," Mellin said. "He didn't care because the death and misery was what he sought that day." During the four-month trial, prosecutors portrayed Tsarnaev as a callous, unrepentant terrorist who carried out the deadly attack with his radicalized older brother, Tamerlan. Tsarnaev's lawyers admitted he participated in the attack, but told the jury he was "a good kid" who was led astray by Tamerlan, who wanted to punish the U.S. for its actions in Muslim countries. They have asked jurors to spare his life. Tsarnaev's lawyer, Judy Clarke, asked jurors to hold open their minds and try to understand how and why Tsarnaev became involved in the bombing plot. "You're now to make a decision about who he is, who he was and who he might become. I'm not asking you to excuse him - there are no excuses. I'm not asking for your sympathy. Our sympathies lie with those who were harmed and killed and their families." Clarke said Tsarnaev's parents favored his older brother and pinned their hopes on him, believing he would become an Olympic boxer. She showed photos of his father at boxing matches with Tamerlan, then asked "Where are the pictures of Dzhokhar? He was the invisible kid." She said the death penalty should be reserved for "the worst of the worst," and that's not the younger Tsarnaev. She said he is "genuinely sorry for what he's done." Can a death penalty opponent's sympathy convince jurors to spare the life of Dzhokhar Tsarnaev? Necn legal analyst Michael Coyne, Dean of the Massachusetts School of Law, joined necn to discuss. Mellin dismissed the contention that the older Tsarnaev somehow led his brother down the path to terrorism. "Tamerlan Tsarnaev was not the defendant's master. They were partners in crime and brothers in arms. Each had a role to play and each played it," he said. Three people were killed and more than 260 injured when two bombs exploded near the marathon's finish line on April 15, 2013. Tsarnaev, 21, was convicted by a federal jury last month of all 30 counts against him, including use of a weapon of mass destruction. The same jury must now decide his punishment. In their opening statement in the penalty phase, Tsarnaev's lawyers urged the jury to sentence Tsarnaev to life in prison, calling it the most appropriate punishment for someone who was 19 when he committed the crime. They said a life sentence would also help the families of his victims, who would not be subjected to the years of appeals and public attention that would almost certainly follow a sentence of death. The defense showed the jury photos of the federal Supermax prison in Florence, Colorado, where Tsarnaev would probably be sent if he gets life. There, his lawyers said, he would be locked in his cell 23 hours a day, living an austere, solitary existence until he dies and being denied the martyrdom he apparently sought. 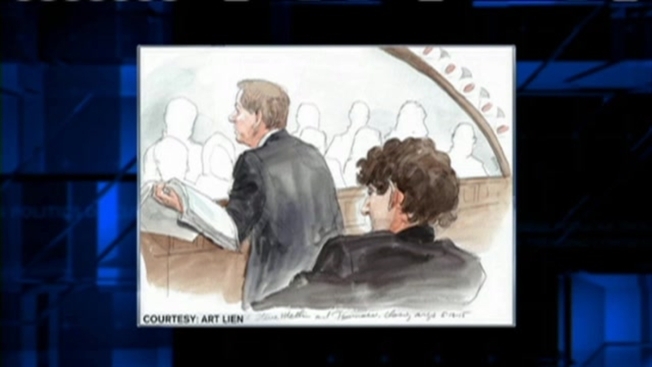 Jurors must be unanimous in their decision to give Tsarnaev the death penalty. If even a single juror votes against death, he will be sentenced to life in prison. Mellin reminded jurors that some of them - before they were chosen for the jury - expressed a belief that a life sentence may be worse than death, in part because Tsarnaev expressed admiration for his brother, who he said died as a martyr. "This defendant does not want to die. You know that because he had many opportunities to die on the streets of Boston and Watertown. But unlike his brother, he made a different choice," Mellin said. "A death sentence is not giving him what he wants. It is giving him what he deserves."